It is common to have watery eyes, runny nose, and sometimes, a headache when you have the common cold. However, these symptoms can be due other health problems as well. If you think your symptoms are unrelated to a common cold, this article will help you determine what the symptoms are caused by. It will also help you learn how to get rid of these symptoms. What Causes Watery Eyes and Runny Nose? The most common symptoms of a common cold are watery eyes, runny nose and sometimes, chest congestion. If you have these symptoms, they are most likely to be due to the common cold. The common cold is simply a viral infection that has taken up residence in the upper respiratory tract, mainly in the throat and nose. This is usually a harmless condition even though it can make you feel miserable. The main symptoms besides watery eyes runny nose are itchy throat, sore throat, congestion, cough, mild headache, sneezing, body aches, fatigue, and a low grade fever. Hay fever is usually also called allergic rhinitis. The symptoms are similar to that of a common cold. Besides the watery eyes, runny nose, and congestion, you may have itching of the eyes and nose, as well as sneezing. It is also common to have a "sinus headache" and blocked ears. Hay fever is usually caused by an abnormal response to an allergen, including dust mites, pollen, other outdoor allergens, mold, and saliva or skin flakes that come off of animals with feathers or fur (also known as pet dander). Nasal blockage or obstruction, leading to problems breathing through the nose. Thick yellow or greenish drainage from the nose or down the throat. Decreased perception of taste and smell. Swelling, tenderness, pain, and pressure in the area of the cheeks, eyes, behind the nose or in the forehead. Coughing which can be worse during the nighttime. You can also get other symptoms, such as headache, jaw and teeth pain, pain in the ears, tiredness, fever, and bad breath, also known as halitosis. Acute sinusitis is usually triggered by the common cold but it can be due to fungal infections, bacterial infections, or allergies. If the conjunctivitis is from allergies, watery eyes and runny nose are often seen along with the above symptoms. This is when your immune system reacts to the intake of a medication. Any type of medication, including herbal medications, prescription medications, and over the counter medications, can cause this type of reaction. A drug allergy is more common with some medications than with others. The symptoms usually begin within one hour following ingestion of the drug, but it can occur up to several weeks later. The most common drug allergy symptoms include watery eyes, runny nose, rash, itching, fever, hives, shortness of breath, swelling of the body, wheezing and itchy eyes. It is rare to have anaphylaxis when taking a drug, but it can happen in some cases. There are some diseases and illnesses that can lead to these symptoms. These include having respiratory syncytial virus, whooping cough, narcotic abuse, and nasal polyps. 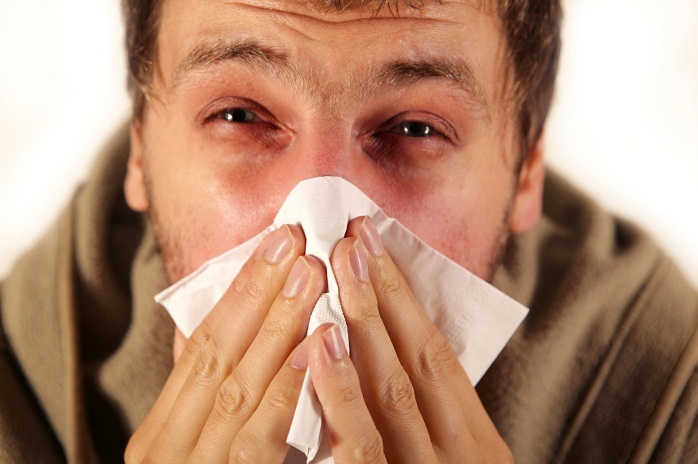 A runny nose and watery eyes usually mean that excessive mucus is being produced by your nasal passages. Fortunately, there are home remedies you can consider that will attack the symptoms of watery eyes runny nose, congestion in the nose, cough, and sneezing. You can use steam in order to let the nose run clear. Steam heat can loosen up the mucus and can help flush out the irritants and infections causing the symptoms. It also helps keep your nasal cavities moist. You can also try taking a 10-15 minute shower or hot both. Use a facial steamer or even a dish of hot water, inhaling deeply to let the heat do its job. Do this twice a day for better relief of watery eyes and runny nose. You can also use a hot steam vaporizer in order to keep the air moist in the bedroom. This will loosen the mucus and help your nose drain. Make sure the room is aired out in the daytime to keep mold from growing in the room. You can use nasal sprays or drops made from salt water. This can relieve the nasal congestion and help get rid of the bacteria inside the nose. The mucus and irritants can be flushed out with the drops. You can make your own saline nasal drops by mixing ¼ tsp. of salt with 8 oz. of regular water. Drop a few mixtures into your nose. Another choice is to use ¼ tsp. of baking soda along with the salt. After you use the dropper, blow your nose carefully to clear out the solution and mucus. Allergens in your living space, such as dust mites, pollen, mold, and pet dander can cause watery eyes runny nose and nasal congestion. You need to get rid of these things in your house as well as irritants that can cause symptoms such as fumes, strong perfumes and paint smells. You can take antihistamines to block the symptoms. They will help clear up the sneezing, watery eyes, runny nose, and itchy eyes you see in allergies and colds. Antihistamines work by blocking histamine in the system and are available both by prescription and over the counter. There are antihistamines that can be sedating and those that will keep you awake.